President George HW Bush has died at age 94. 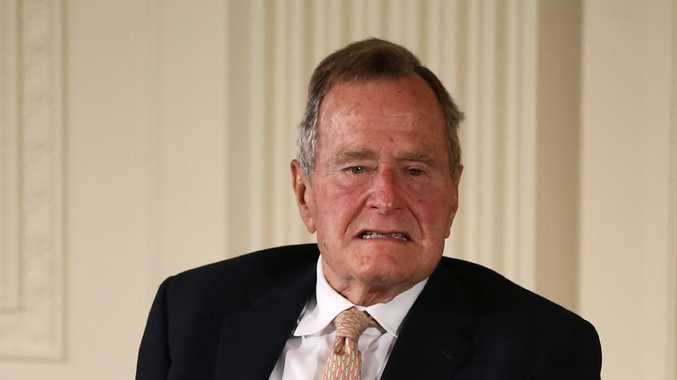 Former US president George H.W. Bush has died aged 94. His son George W. Bush, also a former American president, issued a statement on Saturday (AEDT) paying tribute to his father. "Jeb, Neil, Marvin, Doro and I are saddened to announce that after 94 remarkable years, our dear dad has died," he said. "George H.W. Bush was a man of the highest character and the best dad a son or daughter could ask for. George HW Bush with his wife Barbara Bush in 2004. 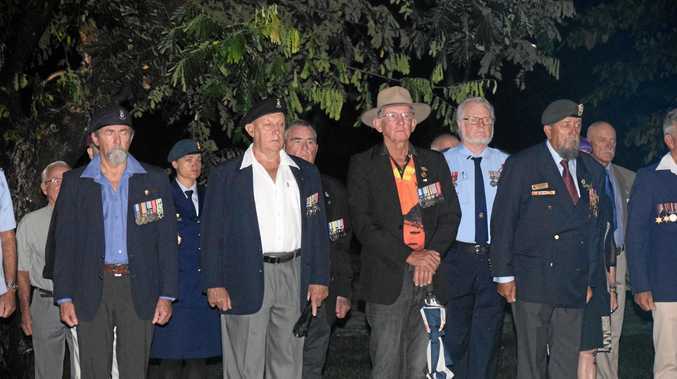 George Snr's death comes months after his wife of 73 years, Barbara, died. It was revealed at Barbara's funeral that her husband had been hospitalised at the same time as her. "I think Dad got sick on purpose so that he could be with her," Jeb Bush said during his eulogy to his mother. George Snr was admitted back into hospital the day after Barbara's funeral when an existing infection spread to his blood. He also spent time at Southern Maine Health care in May after he experienced fatigue and low blood pressure. He was taken there after he met with other military veterans for a pancake breakfast at the American Legion Post 159 in Kennebunkport. He had spent every summer in the seaside town since childhood, except during World War II while he was a naval aviator. President HW Bush with his son President George W Bush. Pic credit George Bush Presidential Library. George Snr was the patriarch of one of America's most formidable political dynasties. Not only was he the 41st President of the US, he served as Vice President under Ronald Reagan for two terms, from 1981 to 1989, and his eldest son George Jnr also attained the White House as the 43rd President. His second son, Jeb, was the first two-term Republican governor of Florida and was an unsuccessful contender for the GOP's nomination for the presidency in 2016, losing to Donald Trump. 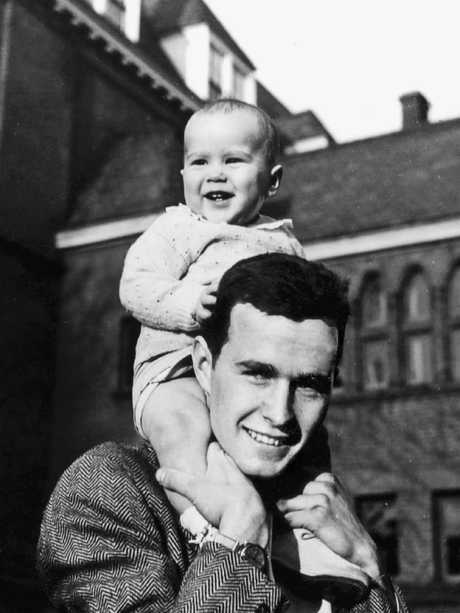 Prior to his political career, Bush served in the US Navy as an aviator during the Second World War. Following his discharge from the military, he obtained a degree in economics at Yale before moving to Texas and establishing his own oil company. He proved to be a successful businessman and was a millionaire by the age of 40. Developing an interest in politics, George Snr joined the Republican party in 1959 and a few years later ran an unsuccessful campaign for the US Senate. In 1971, he was appointed by then President, Richard Nixon, as US ambassador to the United Nations. He continued to support Mr Nixon when the Watergate Scandal broke in 1973, but as Chairman of the Republican National Committee he eventually asked Nixon to resign for the good of the party. George Snr then took on the role of director of the CIA in the mid 1970s. In 1980, he became Vice President of the US after losing the primaries to Ronald Reagan, who later won the general election. Together they served two terms in the White House. In 1988, George Snr ran for President, and won. During his time as president, the Berlin Wall fell, the Soviet Union and communism collapsed, and the Cold War ended. "He'll be admired for ending the Cold War on terms that Americans never could have dreamt possible for the 45 years of the Cold War," Presidential historian Michael Beschloss told USA Today. "It would not have happened if George Bush hadn't been there....He formed a relationship with (Soviet leader Mikhail) Gorbachev of trust that encouraged Gorbachev to give up a lot of concessions." George Snr's actions after Saddam Hussein invaded Kuwait led to the destruction of Iraq's armies and the restoration of Kuwait's independence. His popularity declined massively in 1990 after he broke a campaign promise not to raise taxes. In 1992, George Snr failed to be re-elected, losing to Bill Clinton. Eight years later, he helped his eldest son, George Jnr, become president by joining him on the campaign trail. Barbara first met George Snr when she was 17 years old and they married in January 1945, when she was 19. They had six children and were married longer than any presidential couple in American history. 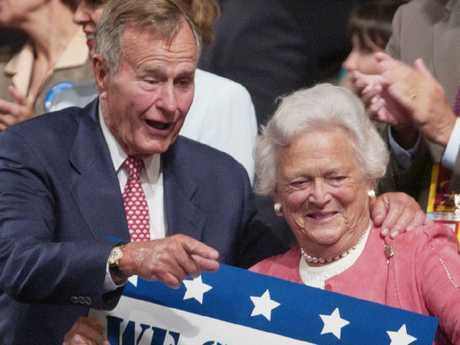 The Bushes were renowned for having a happy marriage, which was underscored with gentle good humour. Upon her death, a spokesman for George Sr said he was "broken-hearted to lose his beloved wife of 73 years. He held her hand all day today and was at her side when she left this good Earth." Last year, George Snr was one of many men in power who faced allegations of sexual harassment. Several women came forward to make claims agains him, with accusations dating as far back to 1992. A spokesman for George Snr said he apologised for any offence caused and that any inappropriate touching was "unintentional".